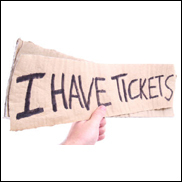 NEW YORK (Hypebot) – This morning Ticketmaster announced deep discounts on many of the summer's top concert tours. Discounts for shows at many of Live Nation's top sheds and outdoor venues are being offered in this year's installment of what has become a late spring annual ritual for the concert industry. Tickets for Brad Paisley, Aerosmith, The Beach Boys, KISS, Motley Crue, Stevie Nicks and others are being offered at a variety of reduced prices. Ticketmaster combined five promotions to create the Summer Ticket Deals program. This year's 3 week seasonal campaign features events and offers from four promotions: 2 For 1 Tickets, Me+3 4-Packs, $40 Below Tickets (plus per order processing fee), Tickets Under $25 (plus per order processing fee) and introducing a new promotion, More Ticket Deals, featuring savings up to 50%. All Summer Ticket Deal tickets are available starting today at www.ticketmaster.com/summerticketdeals.